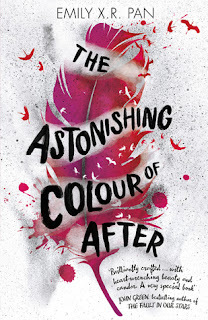 THE ASTONISHING COLOUR OF AFTER - Emily X. R. Pan. Published: March - Orion Children's Books. Triggers/Content Advisory: Strong themes of suicide and mental illness. Leigh Chen Sanders is sixteen when her mother dies by suicide, leaving only a scribbled note: 'I want you to remember'. Leigh doesn't know what it means, but when a red bird appears with a message, she finds herself travelling to Taiwan to meet her maternal grandparents for the first time. Leigh is far away from home and far away from Axel, her best friend, who she stupidly kissed on the night her mother died - leaving her with a swell of guilt that she wasn't home, and a heavy heart, thinking she may have destroyed the one good thing left in her life. Overwhelmed by grief and the burden of fulfilling her mother's last wish, Leigh retreats into her art and into her memories, where colours collide and the rules of reality are broken. The only thing Leigh is certain about is that she must find out the truth. She must remember. This book is beautiful inside and out. That cover is my new favourite thing. I mean, just look at it. It soothes my soul. It also feels incredible, so do yourself a favour and buy a physical copy. Pan writes lyrically, and her style is stunning. It is purple prose, but the metaphors actually make sense and they slam into your chest with a shocking potency; they aren't just flowery words that sound nice together - they make sense. I especially love the descriptions of food (specifically Taiwanese food). There is so much food amazingness in this story and I guarantee you your mouth will watering. Mine definitely was. Another 'purple prose ' aspect to the writing is the colours Leigh continually assigns to emotion. But instead of the author throwing nonsensical colours at emotions, it's Leigh who admits to doing so herself because it's a 'game' she shares with her friend Axel. Lines like "Only the stiff mint green cold of being unable to process what was in front of me", don't really make sense, but it's a quirk Leigh has. It also helps that the story is in first person. It feels more natural; not like the author's trying to be overly creative. The colours-to-emotion quirk is Leigh's. Does that paragraph even make sense?! I hope so! The plot is slow - very slow - but what it lacks in physical action it makes up for in emotional depth and the complexity of the characters' relationships. It's a painful story - gut-wrenching - but it's also hopeful. We follow Leigh's painful journey as she comes to terms with her mother's suicide. It's thought-provoking and every scene has so much substance. There are also some great twists at the end of the book, and the story ends very satisfyingly. The characters are painfully human. They're all complex, vivid, and flawed. Leigh has so much pain inside of her, but her character development is excellent. She really grows over the course of the story, and she isn't the only one - her Dad and other family members do, too, and so does Axel. I also love Leigh's relationships with the other characters. They are all extremely messy and complicated, but they're beautiful at the same time because they are so real. They're broken and hurting and fallible, but they're realistic. It's magnificent. Pan writes them brilliantly. At first I was hesitate about the romance, but it did win me over. Usually when a book is so much about the protagonist's inner growth, a romance can come across like an unnecessary add-on, and I was worried that this book would fall into that trap. But it doesn't. Leigh's relationship with Axel is a big part of who she is and where she comes from, and it makes sense within the story and what Leigh's going through. It doesn't distract from her personal journey - it's a suitable part of it. Sure, the book wouldn't fall apart without it, but it works. The Astonishing Colour of After is a kaleidoscope of riveting emotion. Loss, love, grief, hope, hurt, all collide to deliver a deeply moving and well nuanced novel, slow and complicated and held together by a compelling cast of characters.